If unions in the twenty-first century are to remain relevant, they must embrace what is an ever more connected and networked world. The Fight for 15 movement in the United States provides an illuminating example of some ways in which the Internet can benefit organised labour. Below I discuss three lessons which UK trade unions should take from the early stages of the low-wage worker movement which shaped the ‘Fight for $15 an hour’. This mobilization can be traced to the founding of the Organisation United for Respect at Walmart (OUR Walmart). OUR Walmart was founded as an independent worker association in 2011 by the United Food and Commercial Workers’ (UFCW) union, a union with a broad membership of more than 1.3 million across the retail, food processing and meat packing industries. This article draws on six weeks spent participating in the campaign in California and 43 interviews with workers and union officials (further information can be found here). 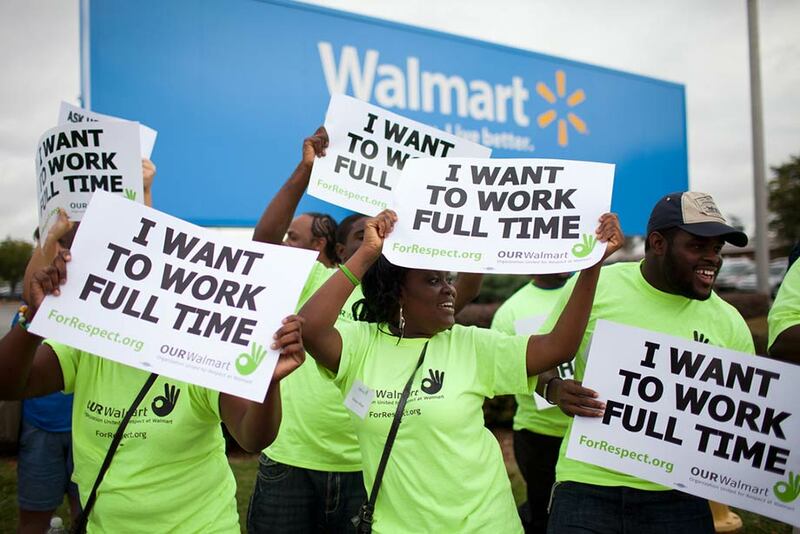 At the beginning of this decade the retailer Walmart was the world’s largest private sector employer with a global workforce of 2.2 million, 1.4 million of whom are hourly paid workers in the US. Walmart was also renowned for its hostility to organised labour and its ability to defeat unionisation attempts. However, the UFCW had identified small numbers of workers at a number of stores who were fed up with their low pay and hours and the prevalent managerial abuse which they routinely face, and were open to a collective attempt at improving working conditions. With the unionised retail sector coming under pressure from the growth of Walmart, the UFCW decided to try something radical: instead of running a traditional union organising campaign aimed at collective bargaining recognition, the union would support workers in forming an independent organisation with the aim of pressurising Walmart to raise labour standards. The campaign was surprisingly successful and in its wake, Walmart increased starting pay to $10 per hour, improving the pay of over 500,000 workers, and in addition the local minimum wages was raised in a number of jurisdictions. OUR Walmart also made use of other internet-based forms of communication such as online video conference calls and voting apps. These online tools enabled workers from across the country to link together and discuss major issues, provide feedback and make decisions. By using a range of internet tools the mobilization was able to take a novel participatory organizational form independent of the union. A further advantage of social media is that it does not entail rigid organisational or communicative boundaries. In the case of OUR Walmart this enabled an expansive form of solidarity to develop in which community and church groups, as well as other low-paid workers and labour unions and advocates could easily connect to the mobilization without themselves needing to be formal members of OUR Walmart. For example, social media enabled traditional and self-generated coverage of these actions to be widely disseminated. OUR Walmart claims there were over 300,000 posts on Facebook and 60,000 tweets on Twitter regarding their 2012 ‘Black Friday’ strike. Facebook ‘Events’ facilitated spreading the word about the dozens of disparate but simultaneous actions which workers undertook as part of the campaign and meant that significant solidarity was mobilised both physically and financially. For example, the sheriff’s department reported that at the main 2012 Los Angeles demonstration, there were around 1,000 supporters. Key to this mobilization was the fact that the union did not attempt to use social media in a traditional hierarchical manner based around vertical downwards communication. Instead, the union acted as a facilitator of network participation, seeking to increase the bottom-up communication. Network forms of organisation do not require total autonomy but rather an orchestrator which can provide strategic oversight. This means that the orchestrator union must not attempt to bureaucratise communication and instead limit itself to allowing the quick and easy sharing of information across the network. OUR Walmart demonstrates how, despite the union being necessarily bureaucratic it was still possible for it to engage with networks in a horizontal manner. Although the UFCW played a vital role in the decision making of the mobilisation, it did not do so in a bureaucratic manner. Instead, the network’s meetings, whether online or in person, were run in a participative manner, departing from the formal process-heavy manner typical of union meetings. Union organisers played the role of facilitators, actively seeking out workers’ views and encouraging participation. The result was that membership was experienced as empowering and workers felt ownership of OUR Walmart and the decisions it made. This article was also posted on the Beyond Trafficking and Slavery hub on openDemocracy as part of a new series on new ideas for union organising. Read the previous blogs in the series by Tom Hunt, Jenny Andrew and Antonia Jennings.